Attention All Singers! Join us for open rehearsals and auditions in January 2019! 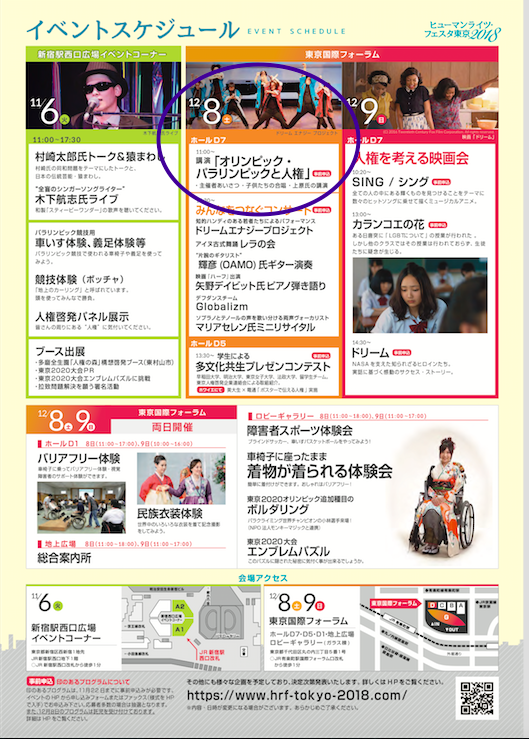 Come hear the Tokyo International Children’s Choir sing at the Human Rights Festa Tokyo on Saturday, December 8 at 11 a.m. in Hall D7! 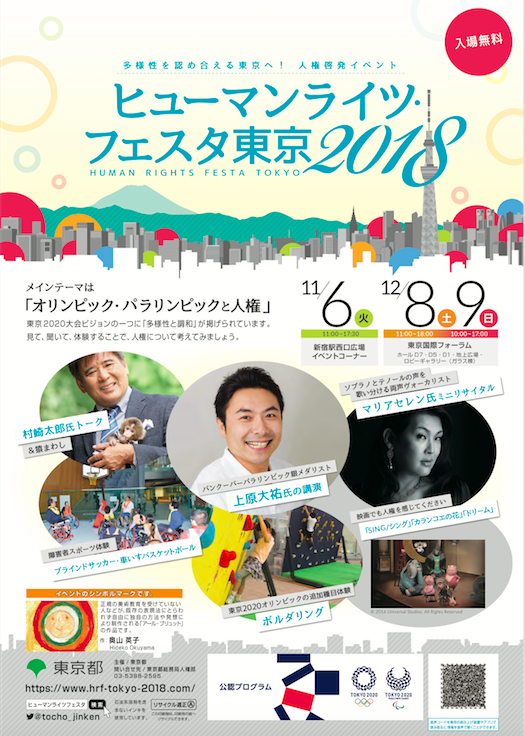 With the fast-approaching Tokyo Olympics in the summer of 2020, the Tokyo Metropolitan Government is hosting a series of concerts, lectures and events to raise awareness of human rights and celebrate differences. 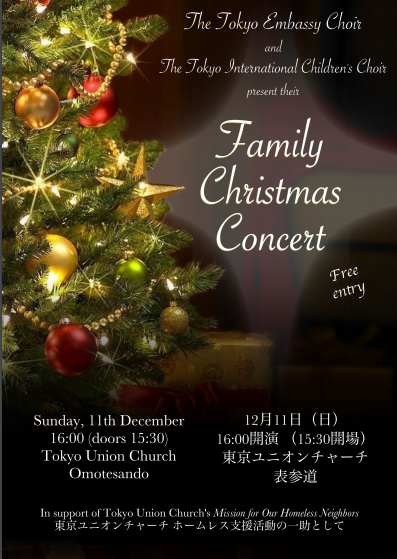 Enjoy the Christmas season with our Family Christmas Concert by joining us at Tokyo Union Church in Omotesando on Sunday, December 9 @ 2:30 p.m.! 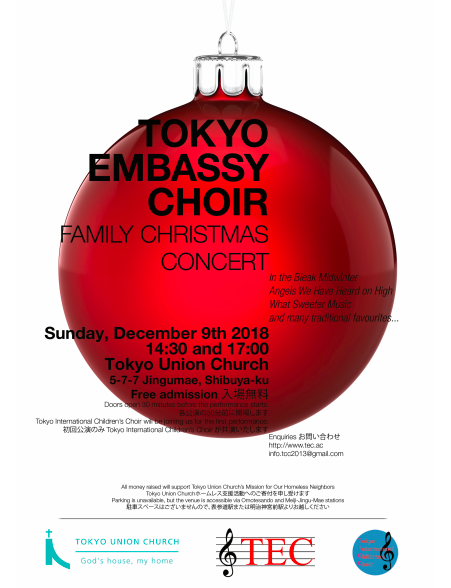 We will be singing t​ogether with the Tokyo Embassy Choir! 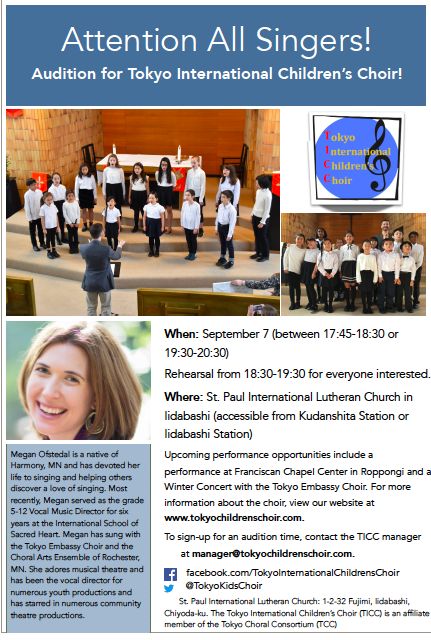 The Tokyo International Children's Choir invites you to audition for our seventh season of singing and fun! 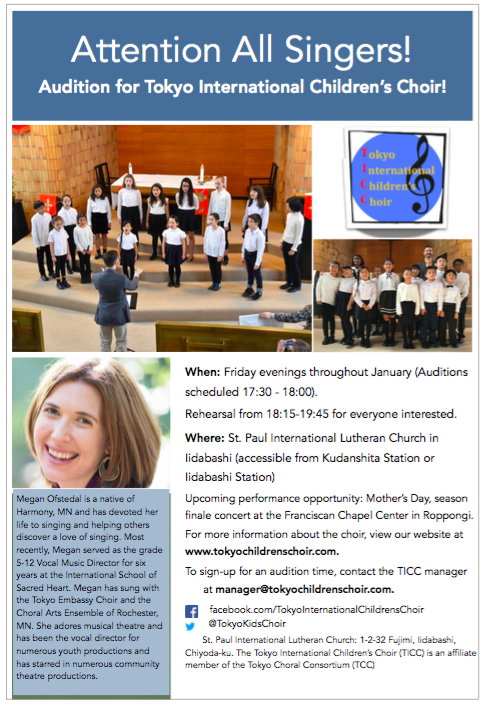 We have a new music director, Ms. Megan Ofstedal, and a fabulous repertoire of songs lined up that children will love to sing! Email us to book a slot! 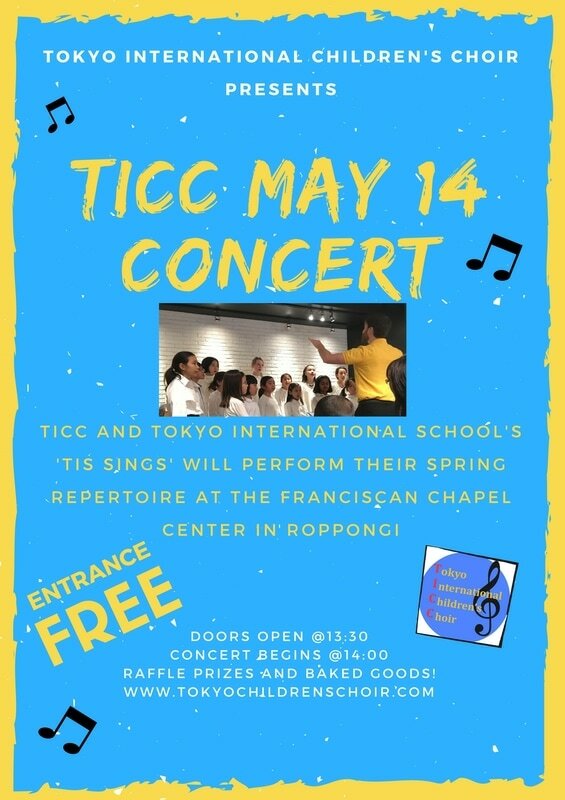 TICC Mother's Day Concert on Sunday, May 13, 2018! Please join us at 2 p.m. at the Franciscan Chapel Center for our season-end concert! 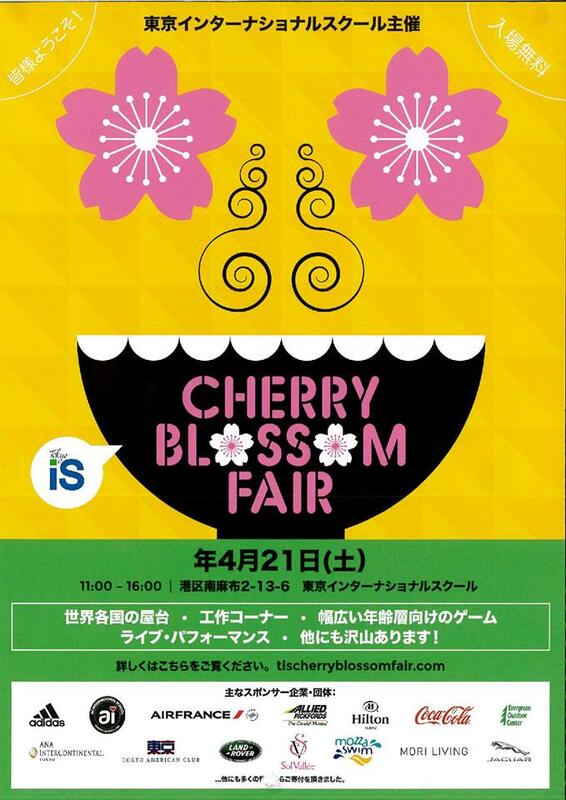 TICC Sings at Tokyo International School's Cherry Blossom Fair on Saturday, April 21 at 12:00 noon! 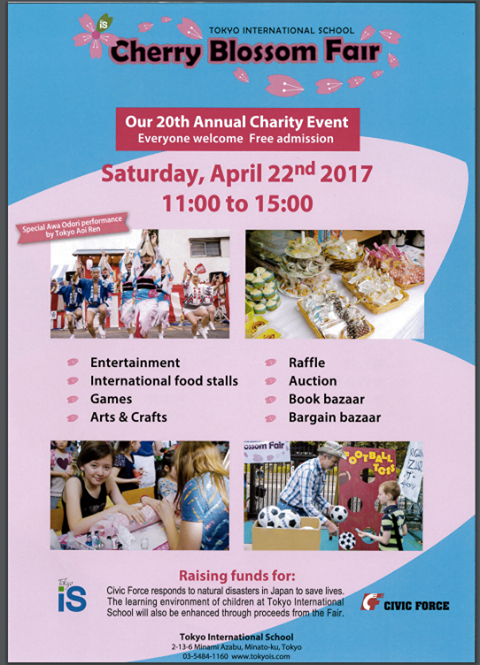 Join us for loads of entertainment and great food! See you there! 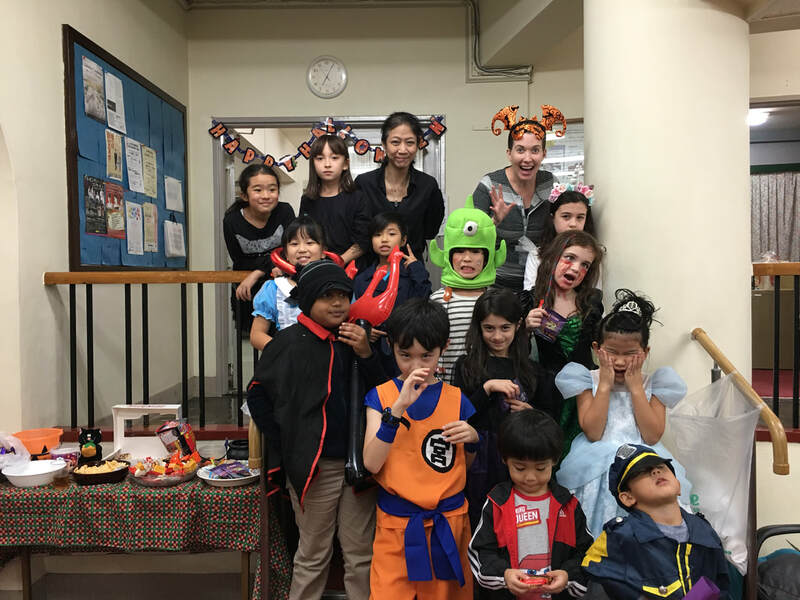 TICC Fundraiser for Sayuri Kindergarten in Fukushima! 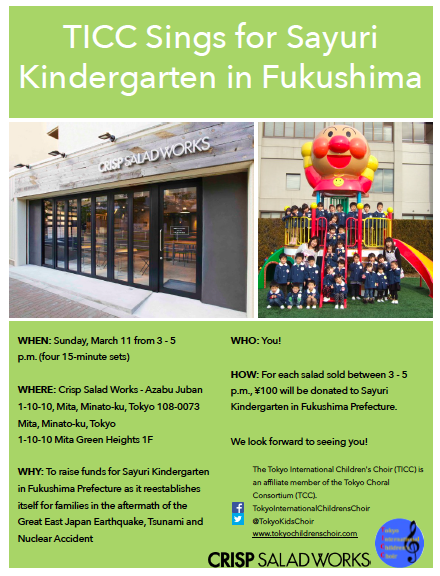 Please join us at Crisp Salad Works in Azabu Juban between 3 - 5 p.m. on Sunday, March 11 to commemorate the 7th anniversary of the Great East Japan Earthquake and Fukushima Disaster. 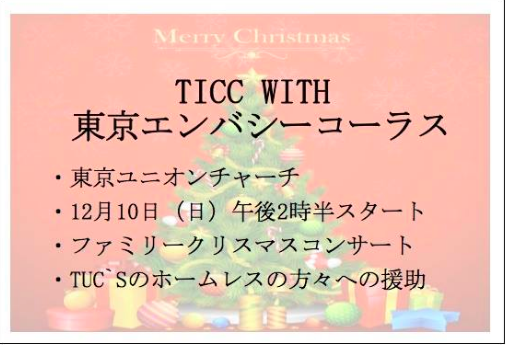 TICC Sings with the Tokyo Embassy Choir at Tokyo Union Church! Join us for this annual family Christmas Concert! Sunday, December 10 at 2 p.m.! TICC Sings at the Franciscan Chapel Center's Christmas Fundraiser! Friday, December 8 at 7 p.m.! AUDITIONS ON SEPTEMBER 1, 2017! Join us on Mother's Day, May 14 for our year-end spring concert! Doors open at 13:30 and the singing begins at 14:00! 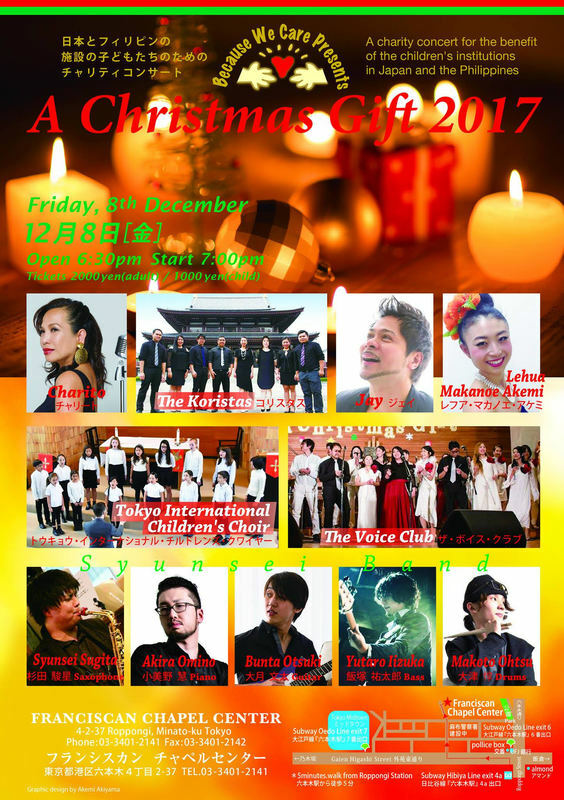 Tokyo International School's 'TIS Sings' group will join us for a few songs. There will be raffle prizes and baked goods for sale! 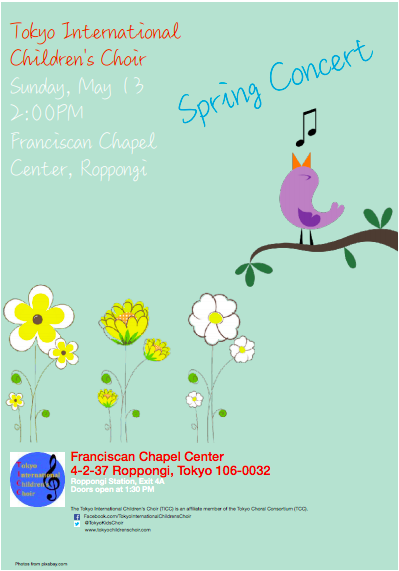 Where: Franciscan Chapel Center in Roppongi! Minato-ku, Roppongi 4-2-37. 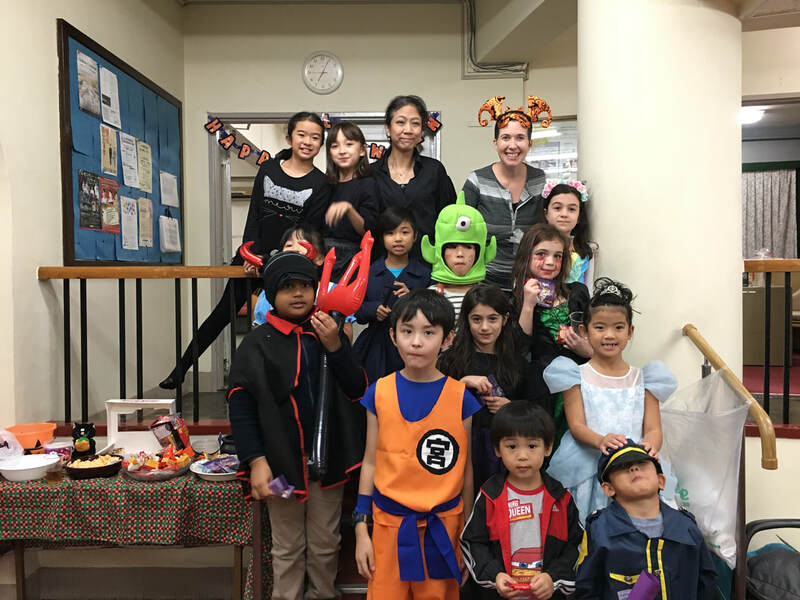 TICC Sings @ Tokyo International School's Cherry Blossom Fair! Saturday, April 22 at noon! ​Pictures from the actual event below! See Below for our two free upcoming concerts on 12/9 and 12/11. 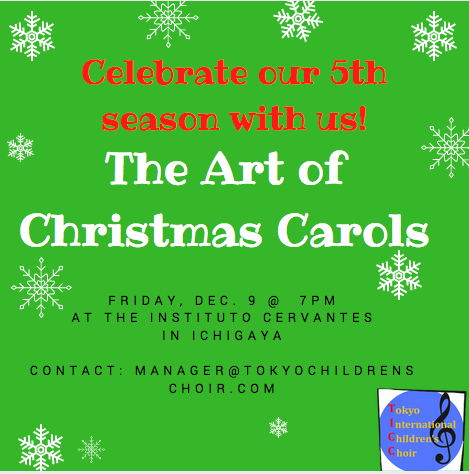 Friday, December 9, 2016 @ 7 p.m.
Join us along with other performers at the Instituto Cervantes, Spanish Cultural Center, in Ichigaya on Friday, December 9. for an evening of Christmas carols! This event is run by EUNIC, the European Union National Institutes for Culture. There will also be a Christmas market with items for purchase. 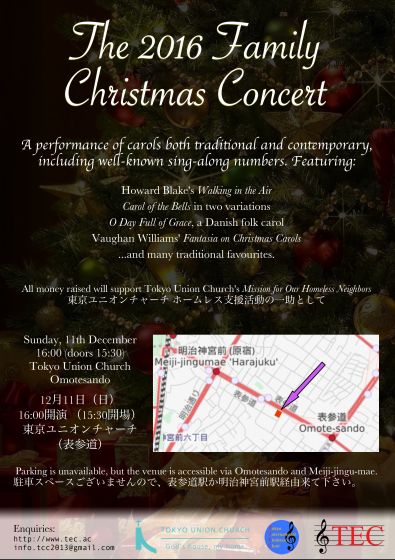 Come hear carols and enjoy the festive atmosphere! 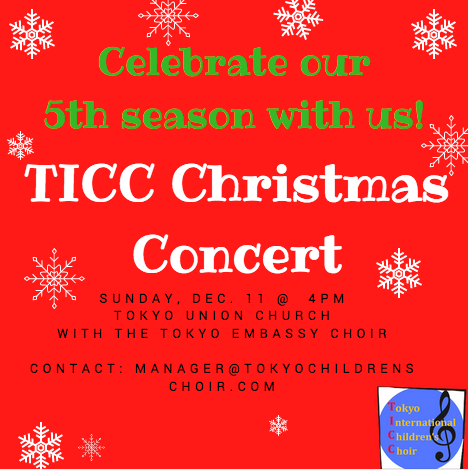 The TICC joins the Tokyo Embassy Choir again for the annual family Christmas Concert at Tokyo Union Church! This beloved traditional never fails to please the whole family!